It doesn't pay to be smart and ignorance really is bliss if you want a long life -- at least if you're a fly, according to new research by a Swiss university. 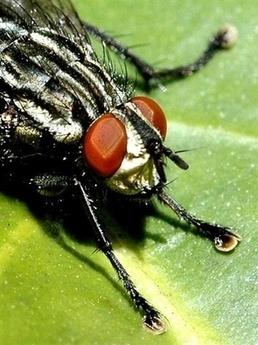 Scientists Tadeusz Kawecki and Joep Burger at the University of Lausanne said Wednesday they had discovered a "negative correlation between an improvement in a fly's mental capacity and its longevity". As part of their research project, the results of which are published in the journal Evolution, they divided into two a group of flies from the Basel region of northwestern Switzerland. One half was left in a natural state while the other had its intelligence boosted by Pavlovian methods, such as associating smell and taste with particular food or experiences. These methods led to flies which clearly learned better and remembered things for longer. The flipside was that the flies left in their natural state lived longer on average than their "cleverer" counterparts, with a lifespan of 80-85 days rather than the normal 50-60..
"In other terms, the more the fly becomes intelligent, the shorter its lifespan," the scientists said. This is most probably because the increase in neural activity weakens the fly's life-support systems, they speculated. "This would explain why flies, like most other animals, have hardly developed their neural capacities," they said.